That Greece is becoming increasingly desperate in its search for funds to pay its creditors is well known, but Thursday’s news from Washington was striking nonetheless. Sources at the International Monetary Fund, the Financial Times reported, confirmed that Greek officials had asked whether it would be possible to postpone the country’s repayments to the group, which amount to €2.5 billion ($2.7 billion) in May and June. The IMF turned Greece down unconditionally. But the request showed that the Greek government itself is no longer confident it will be able to agree with creditors on reforms in time to unlock the bail-out funds it needs to avoid default. With Greece’s mercurial finance minister, Yanis Varoufakis, arriving in Washington today for the spring meeting of the IMF, the country seems to be edging ever closer to disaster. The inquiry about delaying payments to the IMF was typical of the unpredictable behaviour of Greece’s new government, led by the leftist Syriza party. Within the Eurogroup of euro-zone finance ministers, the Greeks’ shifting demands and failure to respect confidentiality have destroyed their credibility. Other members have largely given up trying to understand Greek aims, and are instead setting conditions. On Wednesday Germany’s hard-line finance minister, Wolfgang Schäuble, demanded that Greece stop deluding its people and implement tough reforms quickly, saying the solution to the impasse was “entirely down to Greece”. The president of the European Central Bank, Mario Draghi, struck a similar note in a press conference the same day. 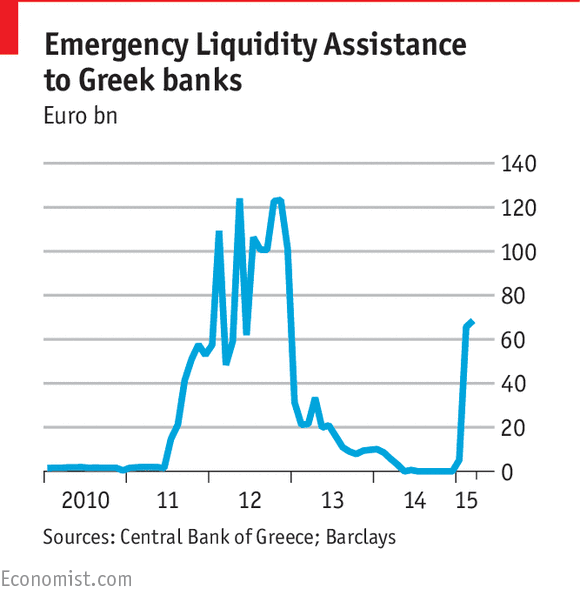 Asked how long the ECB could continue to provide the emergency liquidity assistance (ELA) that is keeping Greece’s banks afloat (see chart), he said that was “entirely in the hands of the Greek government”, which needed to resolve its negotiations with the EU.